I would like to code up a simple method of minimizing the number of coins required to give change. Then I would like see what coins are most likely to be called into usage if change is required from a uniform draw between 1 cent and 499 cents. # I use the 200 and 100 for Canadian coins the  Loonies and Twoonies. # The changer function will do what we want. # currencies first then we will minize coin requirements. # while 3x25 would be the preferred route. # think of using largest coins first always minimizes coin requirements. # all possible change between 1 cent and $4.99 cents. 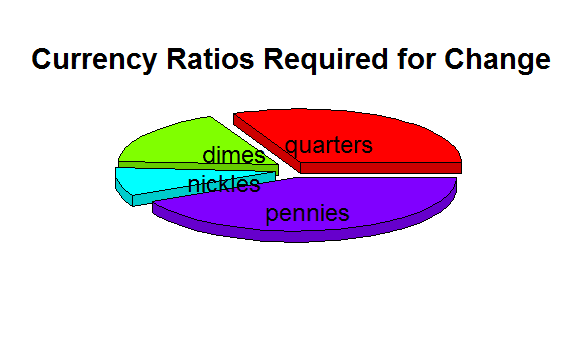 # only 8.5% of the ratio of required coins. # be required whenever change is not divisible by 5, thus ~4/5 times. # after dividing by quarters is greater than 9 cents, thus ~15/25=60%. # portion of the optimal change patterns required. i realize you like to simulate things BUT sometimes it is not the right thing to do. in this case your changer function doesn't produce the correct exact change for all case. this is a prime example of where to use dynamic programing (DP). ### how many coins make exact change? I am very happy that you have written this lengthy response to my original post. In my post I stated that I was not sure if my procedure would work for all coin value options but that I was sure it would work for the common ones. I am still sure but even more so after your response. The reason is because using DP as you have has produced identical results to my original code. As you can see the more rigorous model (DP) has produced the same results. I commend you on your diligence however I think it is worth thinking things through a bit more before throwing the toolbox at every problem that comes your way. If my algorithm had failed to produce optimal results I should think that you would easily have been able to provide a counter example for a change value in which using smaller change would be better than always going with the largest available. Failing to do this simpler task, I chose to stop there before spending my time conceptualizing a more complex procedure. it was not my intent to prove anything was wrong with your simulation or the changer function. But as you write in the intro there are cases where your algorithm doesn't work. And my thought was that DP will work in this case. And so i coded it. I find it interesting that your algorithm works for all possible values. here is new challenge - for which denominations your changer will always give the correct answer. for example c(30,25,10,5,1) is not correct all the time but c(25,10,5,1) is. Thanks for the qualifier and the original comment!